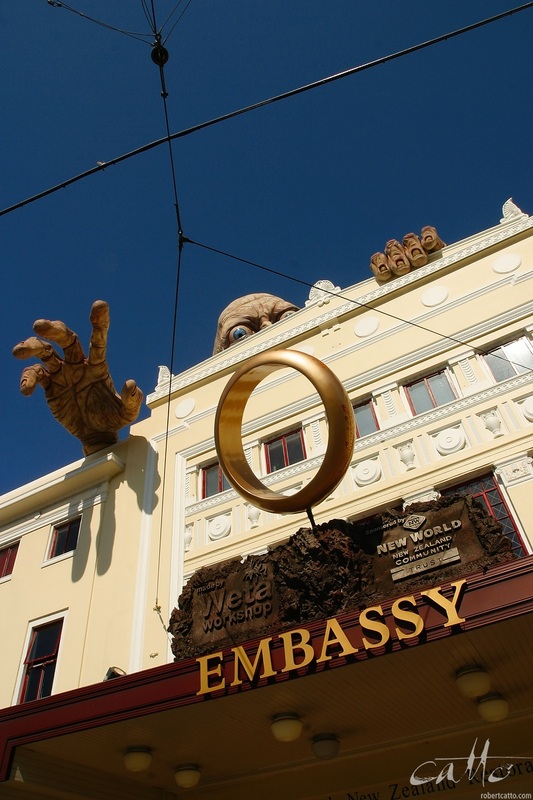 The Lord Of The Rings: The Two Towers premiere in Wellington, New Zealand. Dominic Monaghan and Elijah Wood chase the camera on Courtenay Place. As I mentioned this time last year, not long after I moved to Wellington in the late nineties, Peter Jackson started filming the Lord Of The Rings right in our neighbourhood of Seatoun, where I was living at the time. By the end of principal photography, I had been an Elf, an Orc, a Gondorian and a Rohan - most of them dead, some of them killed by the person I'd been playing the day before - on sets all over the Wellington region. 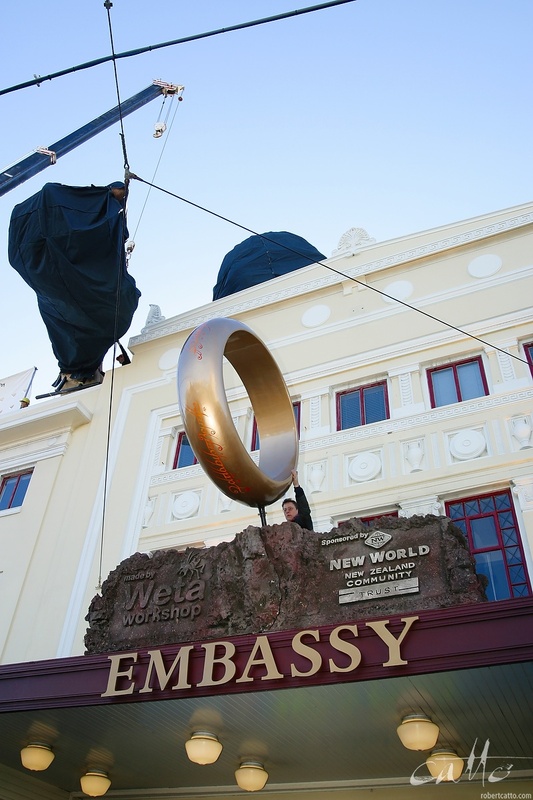 A few days earlier, I'd been up at dawn with the friendly folk from Weta Workshop as they mounted a new sculpture to the facade of Wellington's beloved Embassy Theatre. 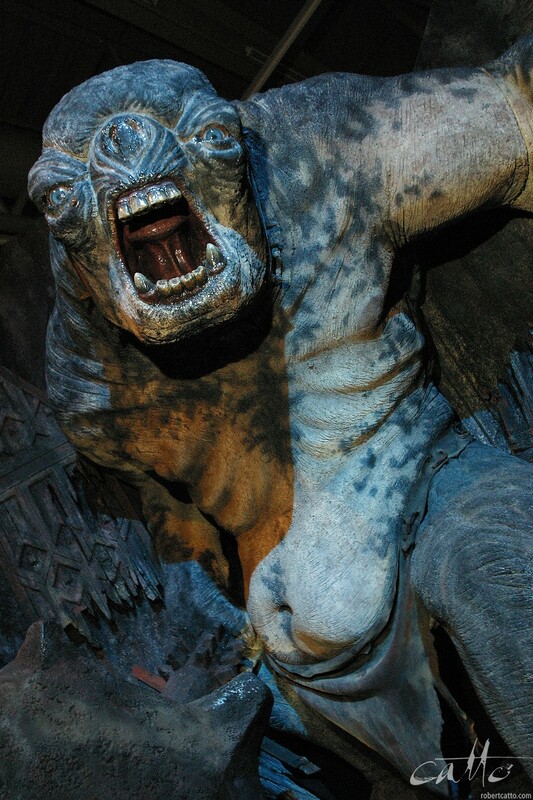 In 2002 it had been a cave troll, featured in the first film at the Mines of Moria. This time it would be a more central character to the second and third films: the creature himself, Gollum. On premiere day, I was back in the media pen, and once again had lined up early in the afternoon to make sure I got a good position, with a view both down the red carpet and towards the building itself. What I hadn't realised was that there'd be a TV camera on a boom behind me - which came precariously close to my head a couple of times! The upside of this (as seen in the first image above) came later, when Dom and Elijah, seeing themselves on a giant screen, decided to play a quick game of 'chase the camera' which led them straight to me. 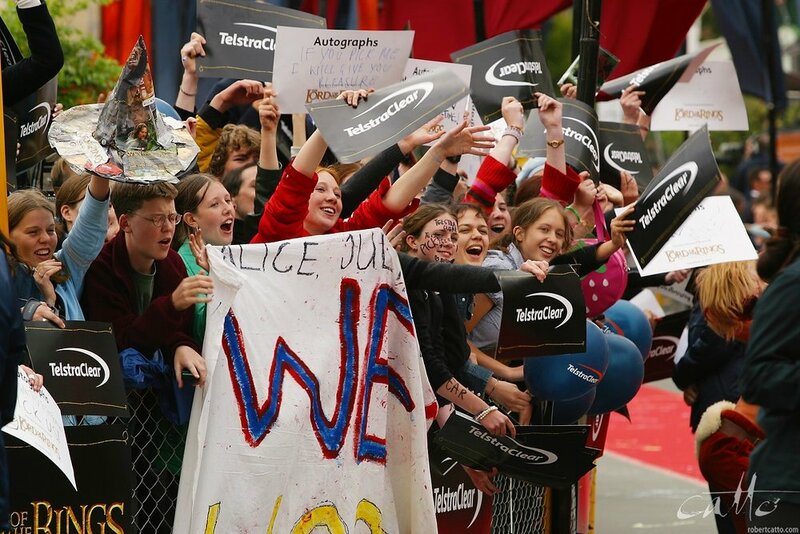 Weta Workshop founder Richard Taylor with fans outside Te Papa, in Wellington, New Zealand. 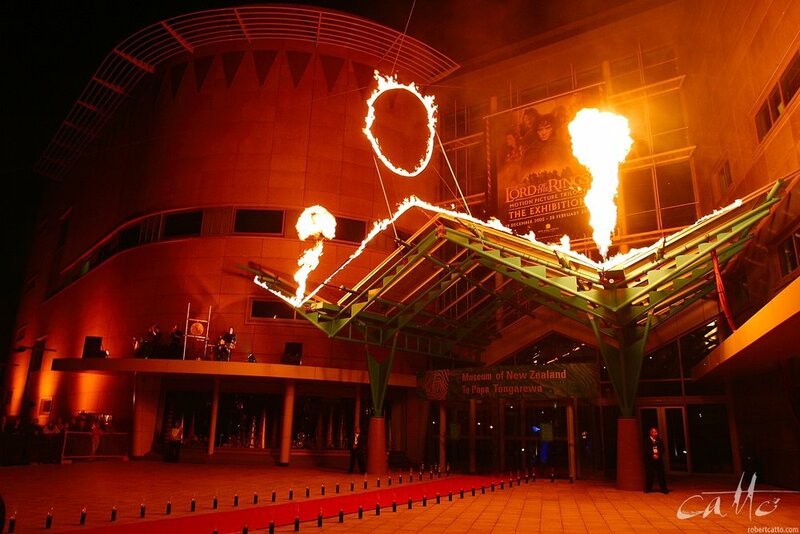 After the screening, there was a reception - okay, party - for the cast and crew at Te Papa, the national museum. Percussion group Strike performed on one of the building's awnings, and were kept warm by jets of flame that leapt into the air on regular occasions. Fans lined up outside there as well, and a lucky few got autographs and a chance to chat with some of the folks involved. Inside, the museum was hosting the first Lord Of The Rings exhibition - though there have been many more around the world since - showing some of the props, costumes, and models used in the films. 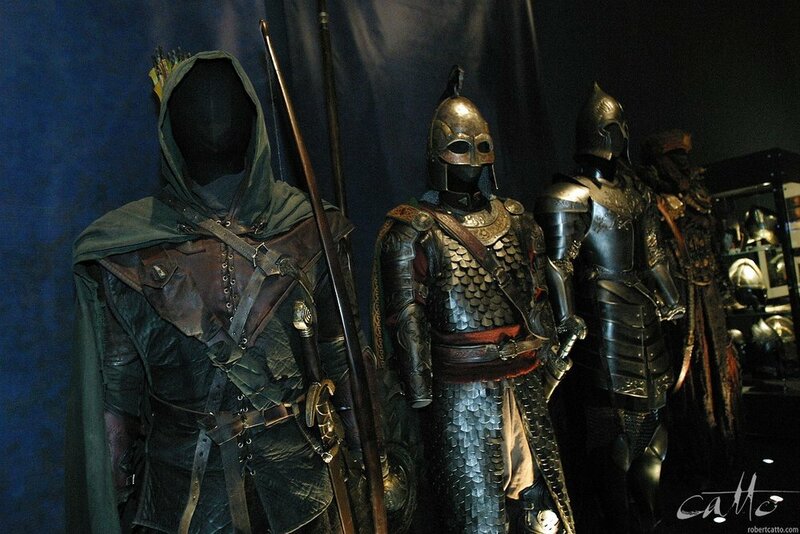 Astonishing design and manufacturing work from the Weta crew on these - and it was nice to be reunited with some familiar costumes from the film...! 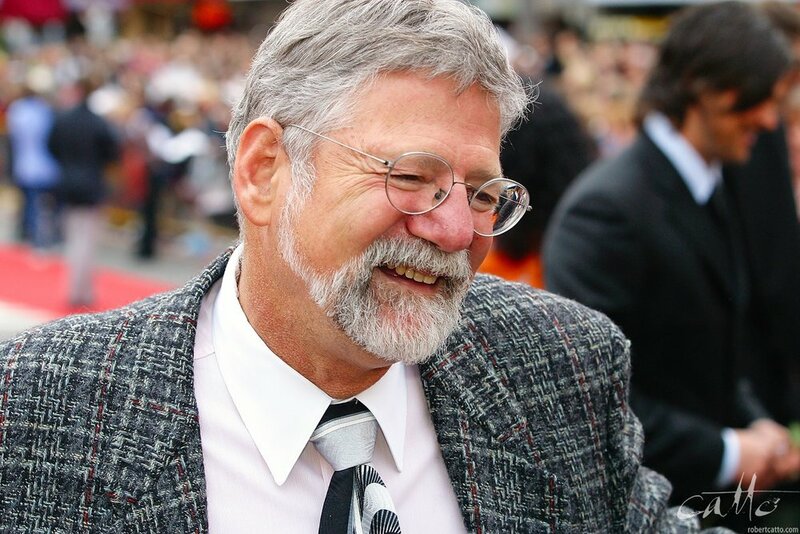 Of course, the high point of the event was Mark Ordesky from New Line announcing that the world premiere of Return Of The King would be held in Wellington, the following year...so check back in December 2018, for more about that!